There are many reasons as to why ‘cable managing’ your office is the right way forward. Not only does it look neat, but it saves time and money, too. Cable management allows you to identify and track cables easily while maintaining the freedom to easily remove or change cables whenever necessary. Equipment and cables can become easily damaged if airflow paths are blocked due to messy, unorganised cables, therefore resulting in overheating. These blockages can cause air conditioning to work overtime, increasing your cost of electricity. By making the effort to correctly manage your cables from the beginning, you’ll save yourself so much turmoil in the future. There are many different solutions to managing your cables that are inexpensive and easy to maintain. With a wide variety to choose from, managing your cables and improving your working standard has never been easier. Having a tidy workstation has also been proven to increases productivity levels amongst employees, therefore resulting in a much happier and more efficient workplace. 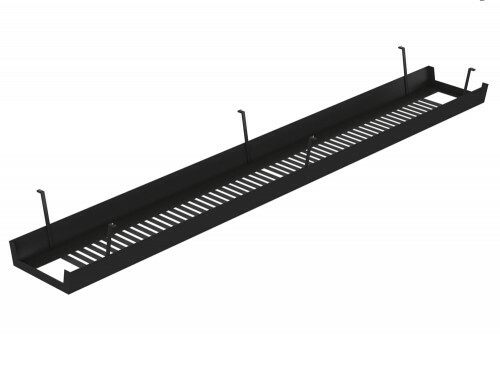 The most popular cable management solutions are cable baskets, cable spines, port holes and grommets. These options are affordable, practical and aesthetically pleasing. 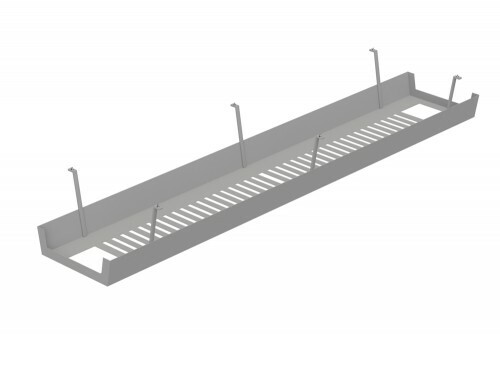 Our range of cable trays and vertical cable management solutions come in white, silver, graphite and black, and are therefore suitable for all office environments. Our portholes and table inserts come in grey and silver and are easy solutions to keeping your cables tidy at all times. There are many benefits to implementing great cable management solutions in your office. Firstly, and some would say most importantly, it saves you time and money. Badly managed cables can cause over-heating, bending and tangling. Tangled wires make it difficult to locate the correct wires that need to be either replaced or unplugged, therefore forcing you to spend unnecessary time focusing on your cables rather than your work. It can be extremely tricky to clean those hard-to-reach areas under your desk, especially with messy cables lying on the floor. 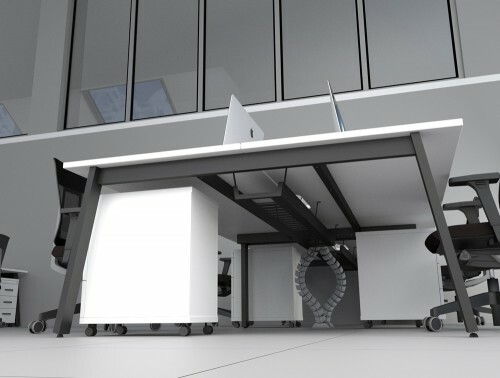 With under desk cable management solutions, your floor space is left clear and clutter-free, allowing you to remove gathered dust. Definitely one of the most popular options to choose from, a cable spine is a great way to keep all of your cables grouped together. 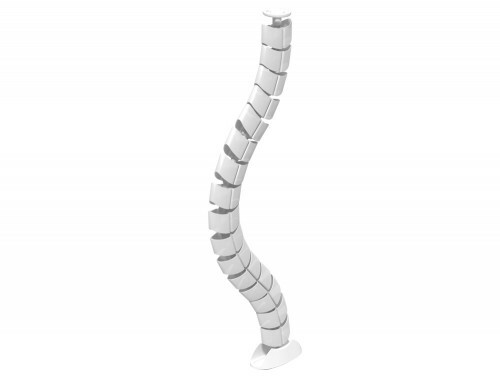 Designed to look like a human spine, these also act as a protective cover to your cables, preventing them from getting damaged. If you work in a busy office where people are constantly walking past your desk, it’s easy for your cables to get knocked as they walk by. Someone’s leg could brush past a loose cable and all of a sudden your computer’s energy is cut and all of your work is lost. Cable management solutions, like cable spines, cable baskets and portholes, prevent such things from happening. Not only are cable spines well designed, they’re aesthetically pleasing, too. 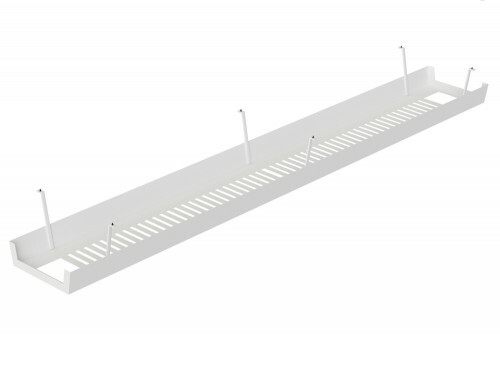 Available in white, grey and black, we have cable spines that suit all business environments as well as their interiors. 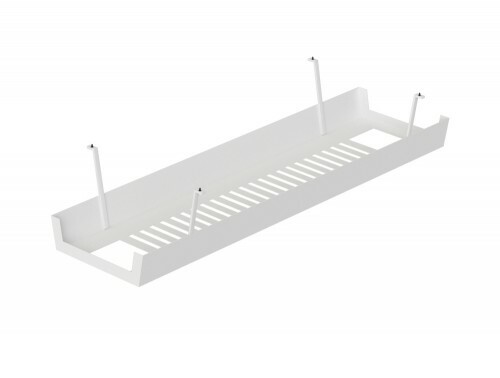 Cable baskets are bolted to the underside of your desk in order to keep your cables off the floor. With a modesty panel, cable baskets are invisible to anyone looking at your desk which keeps your office looking clean and organised. 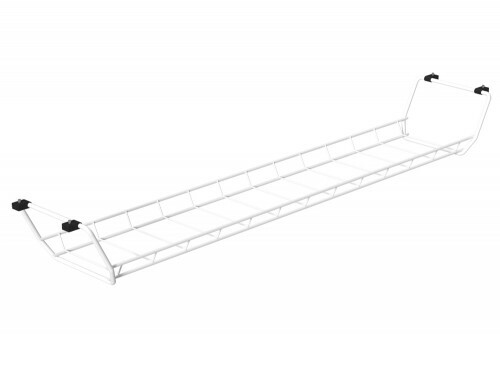 Available in white, silver, graphite and black, cable baskets are also available as cable trays. Both work equally as well and help to regulate airflow. 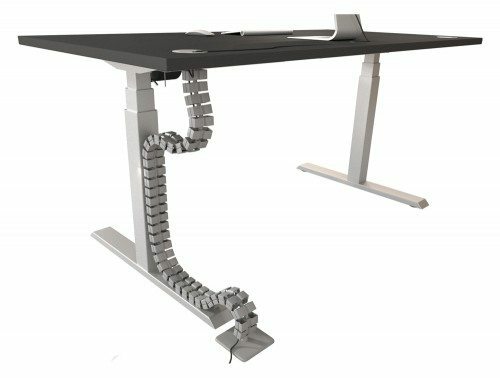 On top of the many other advantages of cable management, it improves the overall aesthetics of your business or home office, too. A company that has every cable neatly organised reflects a well-managed and professional business. It’s also extremely dangerous to have loose cables lying around the office as someone could seriously injure themselves. Your employees’ safety should always come first, and with the correct use of cable management solutions, you’ll never have to worry about loose cables being pulled or tripped over. This can also be especially dangerous if you work from home and have children or pets. If your cables are installed correctly from the start, there’s less risk of your cables bending and overheating. Portholes and grommets are easy to place into your desktop and are especially useful for boardroom tables. By just cutting out a section of the desk, a porthole is slotted in to allow your cables to easily pass through the middle of your table without hanging over the sides. Remember that you only get one chance at first impressions. Even if you’re great at what you do, a cluttered and disorganised office can give your potential clients the idea that your priorities aren’t in their best interest. Not only will cable managing your business save you time and money, but it’ll ensure that your business is safe, organised and hassle-free! If you’d like to find out more about our Cable Management Range or discuss your requirements, simply request a callback.